Kathrine Switzer knows what it means to run for equal rights. Fifty years ago, she made headlines as a 20-year-old Syracuse University student who was attacked by an official at the Boston Marathon because women weren’t supposed to participate in the race. And on Monday, the now 70-year-old ran the marathon again, wearing the same bib number, but under very different circumstances. “I just ran the fastest marathon I’ve run in 46 years,” she told TODAY, having finished the 26.2-mile course in 4 hours, 44 minutes and 31 seconds. She even posted updates on social media throughout the trek! As Switzer recalled, her coach Arnie Briggs dissuaded her from even trying the marathon. “He said, ‘No dame ever ran no marathon,'” she said. That wasn’t correct, of course; women had been running long distances for years, but were generally not given slots in big city marathons. In 1963 two women crashed the Western Hemisphere Marathon in Culver City, Calif., and one finished. In 1966, Bobbi Gibb (who served as Grand Marshal for 2017’s Marathon) also crashed the Boston Marathon with an unofficial finish of 3:21:40. But while Gibb seemed to pass unnoticed during the run, race director Jock Semple was infuriated and went after Switzer midrace. “He threw me back and he said, ‘Get the hell out of my race and give me those numbers,’ and tried to pull my bib numbers off,” recalled Switzer, whose boyfriend and coach ran interference. “I turned to Arnie and said, ‘I’m going to finish this race on my hands and my knees if I have to,'” she said. 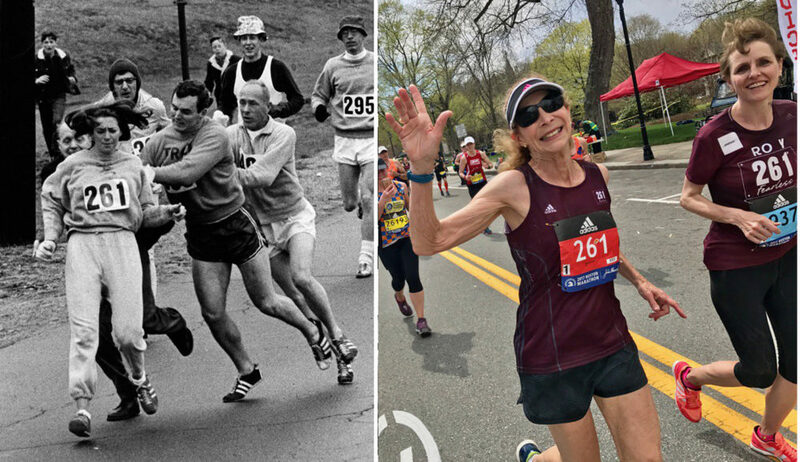 On Monday, her bib number, 261 — the same one she wore in 1967 — became only the second number ever to be retired in Boston Marathon’s history. Shockingly, it would be another five years before women were officially allowed to compete in the Boston Marathon. But today, women have their own starting line and are regular participants in a race that once kept them locked out. Hi, it’s understandable article along with this YouTube video; I cant think that one can not understand this effortless paragraph having with video demo.